* Collect 50 DC Comics characters and flex your new super abilities--soar through the air with free-roaming flight, freeze and push objects with Super-Breath, and heat up and cut holes through objects with Heat Vision. * Master new suits and gadgets such as Batman's Power Suit and Robin's Hazard Suit equipped with a Pressure Cannon that can absorb and dispense hazardous liquids. 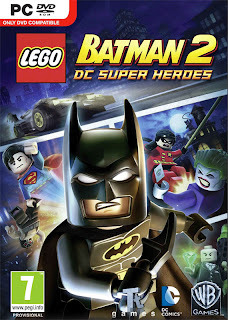 * Players can also explore Gotham City by walking, flying or unlocking and controlling a variety of cool vehicles including the Batmobile, Batwing and Batboat. * For the first time in a LEGO video game, hear the LEGO characters talk! * Enjoy the game with friends and family using easy drop-in/drop-out co-op play that features dynamic split screen.